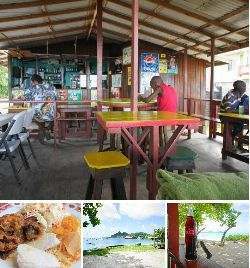 ﻿ Restaurants and bars on Carriacou, snacks and pizzerias. Restaurants and bars on Carriacou, snacks and pizzerias. Guide for wining and dining on Carriacou island. Pizzeria takeaway and seafood restaurants local bars. Harveyvale and Hillsborough restaurant and bar guide. These restaurants and bars on Carriacou have been sorted alphabetical. Local dishes include Coo-Coo, Stew Peas, Stew Pork, Rolled rice, Oil Down. Bars and rumshops on Carriacou. Previous: Activation of your membership.